Terrible product. Terrible ingredients. It feels like I’ve added nothing to my hair. This is not the product for you if you want to use organic or more natural haircare products. “Foam conditioner”? What were you thinking? WATER, ISOBUTANE, PROPANE, QUATERNIUM-80, PROPYLENE GLYCOL, CETEARYL ALCOHOL, CETRIMONIUM CHLORIDE, TRITICUM VULGARE (WHEAT) GERM OIL, MENTHA PIPERITA (PEPPERMINT) OIL, MENTHOL, MENTHA ARVENSIS LEAF OIL, ROSMARINUS OFFICINALIS (ROSEMARY) LEAF EXTRACT, HISTIDINE, ALOE BARBADENSIS LEAF JUICE, ECKLONIA RADIATA EXTRACT, FRAGRANCE, PVP, PHENOXYETHANOL, BEHENTRIMONIUM CHLORIDE, DISODIUM EDTA. The smell of this “conditioner” (ha!) is even worse than the shampoo. The chemical smell is entirely too obvious. This is a ‘no’ for me. This product was sent to me for review via the Influenster program. 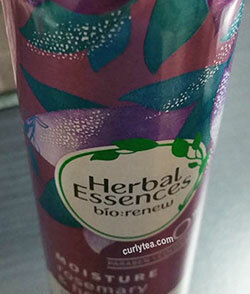 So, how did the Herbal Essences Rosemary And Herbs Foam Conditioner Review work?? It didn’t. This, to me, provided no moisture and no protection. 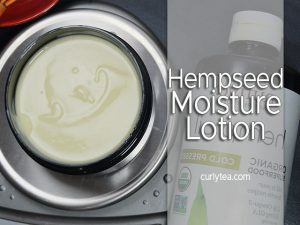 Do you know how some products have a ‘weightless moisturize’ effect? This isn’t one of them. This one did nothing for my 4b-4c curls. And it’s a rinse off conditioner too. I’ve never outright disliked an Herbal Essences product before this one. This may (or may not) work for people with straight, fine hair. But it did nothing for my hair. You apply it, let it sit/absorb, then rinse. Nothing. Don’t you dare try to detangle with it… I mean, if you want to test that, you can, but…. you may come out better trying to detangle with water. Please don’t even think about using this as an deep conditioner. The first thing I noticed is Behentrimonium Chloride is the 2nd to the last ingredient on the list. *crickets* I can’t. There’s more preservative in this “conditioner” than Behentrimonium. You’ll recognize “Behentrimonium” from my most fave conditioning emulsifier Behentrimonium Methosulfate (BTMS-50). ISOBUTANE – ISOBUTANE has a score of 7 at EWG.org. SEVEN. Things classified as “high hazard” have a score of 7-10. Isobutane is a “hydrocarbon gas” added to products as a propellant. PROPANE – Propane has a score of 4 at EWG.org. Propane, too, is a hydrocarbon and is used as a propellant in products. It too is a byproduct from the oil refining process. QUATERNIUM-80 – Quaternium-80 is used as a “hair conditioning agent” and to fight frizz. It seems to be the “conditioner” they chose to do the heavy lifting in this product because it’s the 1st conditioning ingredient on the ingredients list. It gets a 1 at EWG.org. ‘Quat’ means “quaternary ammonium cation” and functions to help keep the product on the hair. The cationic (positive charge) effect is said to help control fly-aways. I don’t know how much this will help if you ultimately have to rinse the product off of the hair. The “80” in Quaternium-80 has no significance. A number is assigned as a new quaternium is invented (or found). PROPYLENE GLYCOL – Propylene Glycol (propane-1,2-diol) is a colorless chemical made from propylene oxide. It is a byproduct of the oil process; a “petroleum derivative”. 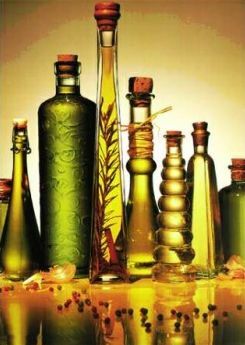 In haircare, it’s used to help maintain moisture and prevent “the escape of moisture or water”. It gets a 3 on the EWG.org website. HISTIDINE – Histidine is listed as an amino acid and hair conditioning agent. It may also be used as “fragrance” ingredient. It has a 1 on EWG.org scale. CETRIMONIUM CHLORIDE – Cetrimonium Chloride gets a 3 in EWG.org database of ingredients. It’s a quarternary ammonium compound used as a preservative, anti-static (anti-frizz) agent and as a conditioning agent in conditioners. ECKLONIA RADIATA EXTRACT – You’ll recognized this ingredient in the curlytea.com’s “What The What?” section. It is Australian Sea Kelp extract often used in haircare and skincare products. It’s an ingredient I first noticed in the Aussie Mega Moist Conditioner. Everything. The fact that there’s more fragrance, PVP and preservative in this product than behentrimonium bothers me. It has never been my goal in life to condition my hair with isobutane. Never. Worst. Conditioner. Ever. I have 3a curly hair.